Bormio is a great choice for your ski holiday with all your family. Here the offer for wonderful ski holidays is rich - here a great time will spend extreme sport enthusiasts on freestyle area or try breathtaking paragliding. Be sure to enjoy your favorite slopes also at night time - Bormio offer 4 km of ski slopes also enlightened at night. Bormio is located in Northern Italy in the heart of Alps. 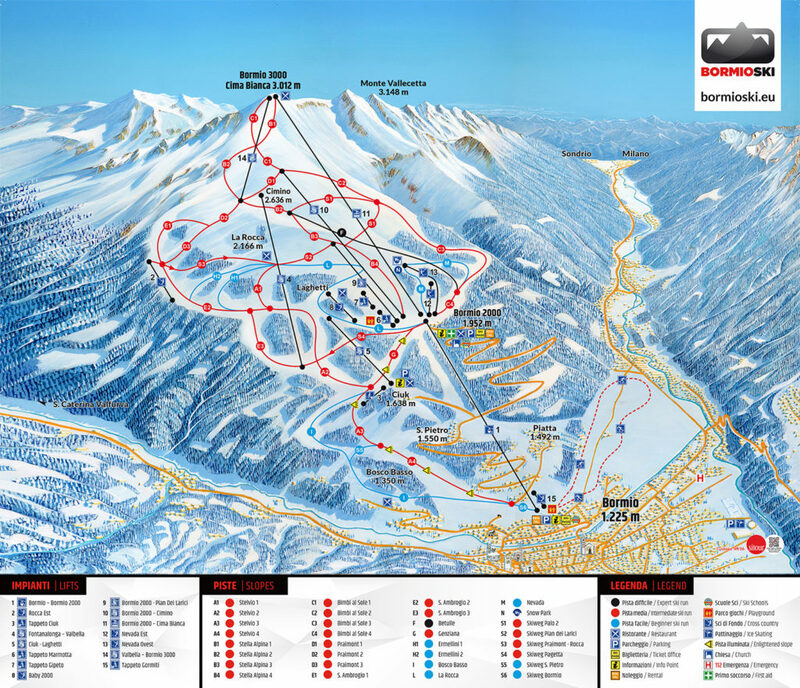 It is quite new ski resort and that’s way all the facilities and lifts and new and modern. The ski resort is perfect for all skill levels. Experts and intermediate skiers will find here competitive level slopes while beginners will feel comfortable on easier slopes. There are good train services from Italy and most surrounding countries to Bormio. Train station is located in the town and is easy reachable. If you are wandering about the transfer price to Bormio, here is how we develop it. We are taking into account several specifics of your trip, but you can count on Alps2Alps to get you to Bormio on time throughout the season. Our main goal is to provide the best transfer service with the lowest price possible. The mentioned factors will only result in our base rate going down and never up. We love to offer great discounts if you are travelling in off-season and off-peak time to Bormio. If you choose your transfer in midweek (Monday to Friday) the prices can be even up to 60% lower than weekend prices. So if you are looking for big saving, we suggest you to choose midweek for your transfer. Apart of factors mentioned before, your transfer price will be also influenced by availability of our vehicles, transfer schedule, vehicle utilisation and other costs like road tolls and airport parking charges. If you are looking for the best ski resort to travel with your whole family, choose Bormio and you won’t regret it. It offers several gentle slopes for kids or ski beginners, great ski schools to introduce younger family members with winter sports.Even when the snow/weather isn’t at its best, Bormio has several facilities for a whole family, including, Mini club and Gormiti Park, where all family can have loads of fun. Be sure to reserve your seats as early as possible for the best possible prices for ski transfer to/from Bormio. If you are planning to travel to Bormio during peak season, book your transfer early as they tend to fill up fast. If you can not find the service you have been looking for, contact Alps2Alps and we will do everything to help you. Wherever you choose to go, Alps2Alps will help you get the most from your ski trip!